James McNeill Whistler, Tate Gallery, London; Musée d'Orsay, Paris; National Gallery of Art, Washington, 1994-1995, no. 125, as Arrangement in Black - No.3. James McNeill Whistler. Exh. cat. Tate Gallery, London; Musée d'Orsay, Paris; National Gallery of Art, Washington, 1994-1995: no. 125. 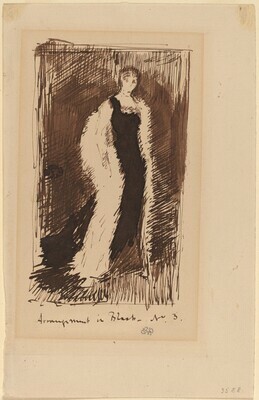 MacDonald, Margaret F. James McNeill Whistler: Drawings, Pastels and Watercolours: A Catalogue Raisonné. New Haven, Connecticut: Yale University Press, 1995, no. 851.